Hang on to your hats. We have mostly young, little read, inexperienced, idealistic persons with little business or finance savvy at the helm here now. Many would have negligible cash savings so the destruction of the value of these of no consequence to them. Never mind the moral aspect; persons with unspent money are traitors to the economy and deserve punishment. Hyper inflation solves debt for both the government and home owners And all move up the tax brackets. A bout of wild inflation through the 1970s followed the large General Wage Order. Now we have road cone watchers elevated to a “living wage”, a huge increase in the minimum wage, wages for care givers in homes elevated hugely, a giant hike for nurses with teachers to follow. Venezuela here we come. 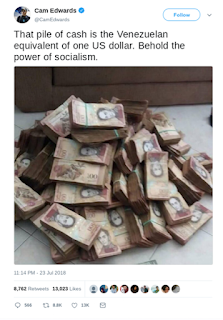 Winston Churchill said..."Socialism is the philosophy of failure, the creed of ignorance and the gospel of envy.It's inherant virtue is the equal sharing of misery"